Hello Friends! Was it just me or did this seem like a long week? Well, thrifty Friday is finally here and this girl is ready for the weekend! Are you ready for today's fabulous find? Happy Wednesday Friends! My patio umbrellas take a beating from our Texas sun. I have two and they were both dreadfully faded. I prefer the metal crank variety and have not seen any colors this season that appeal to me. Besides, they are so expensive! Not quite sure what to expect, I took a chance on spray painting them. 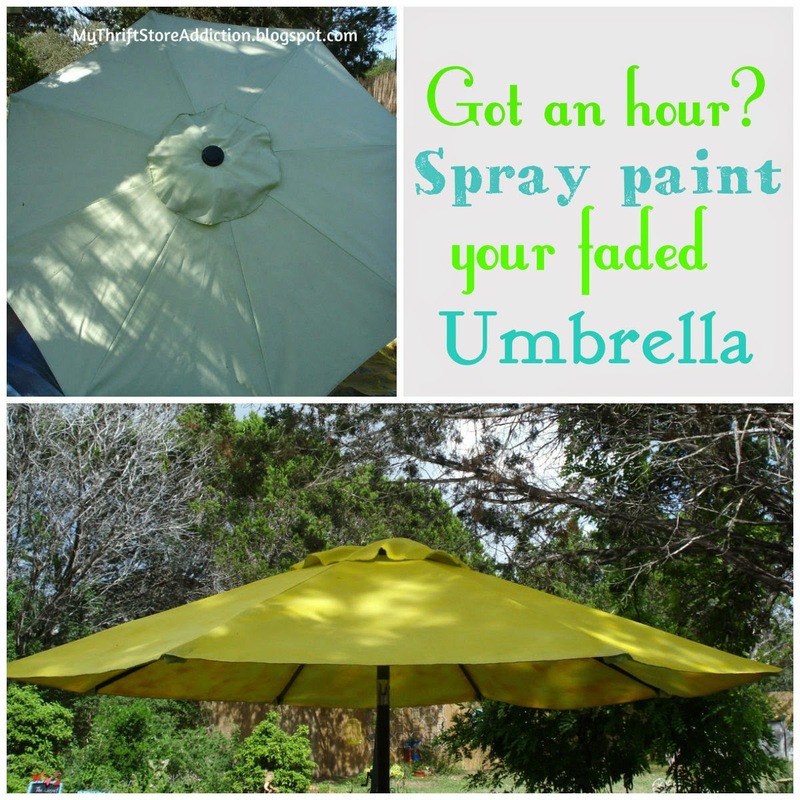 Instant upgrade--three cans of spray paint and one hour later, my two umbrellas went from drab to fab! 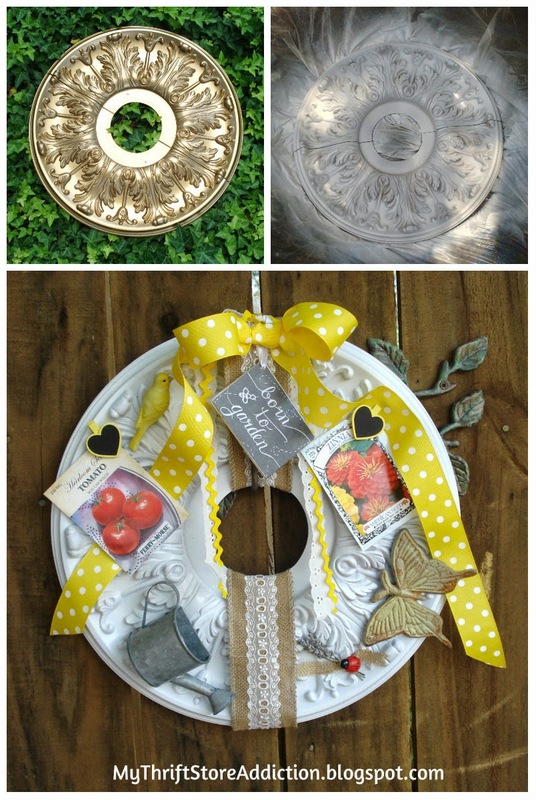 From Ceiling Medallion to Garden Wreath! Hello Friends! 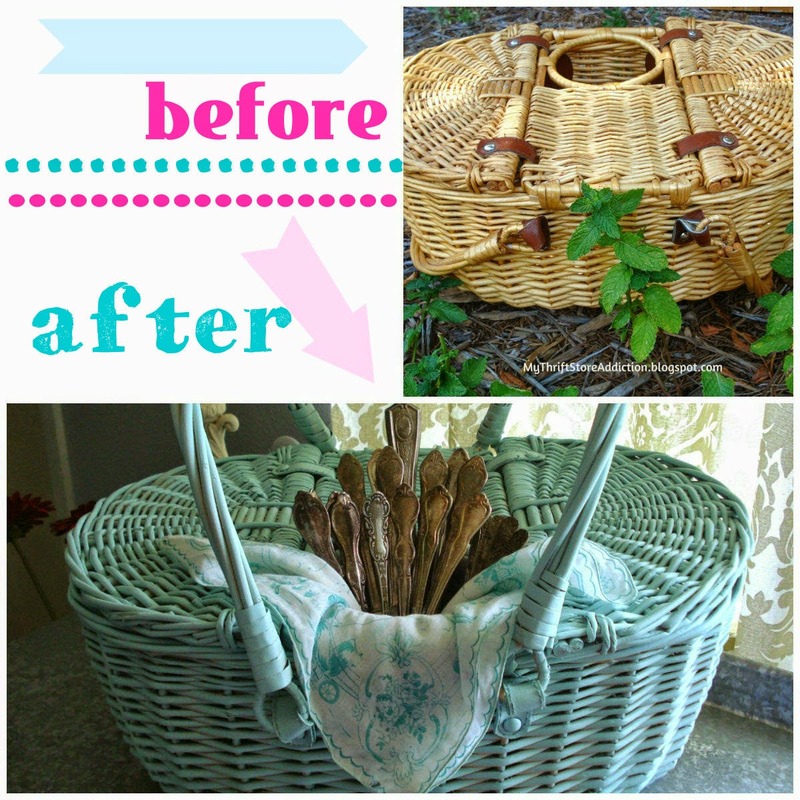 Today I am sharing my latest repurposed endeavor! I picked up this ceiling medallion for .25 at my favorite weekly sale. While I did not have a specific project in mind, the intricate design appealed to me. Around the same time, I found several adorable chalkboard signs for 50% off. I loved the garden sentiment and was inspired to create a wreath. TGITF, y'all! I hope you've had a blessed week. Today I am featuring two lovelies that I found for my Etsy shop. Both are Vintage with frame worthy illustrations. I have had a love affair with books for as long as I can remember. I occasionally read a book on my Kindle but I still prefer the feel of a book in my hands. How about you? 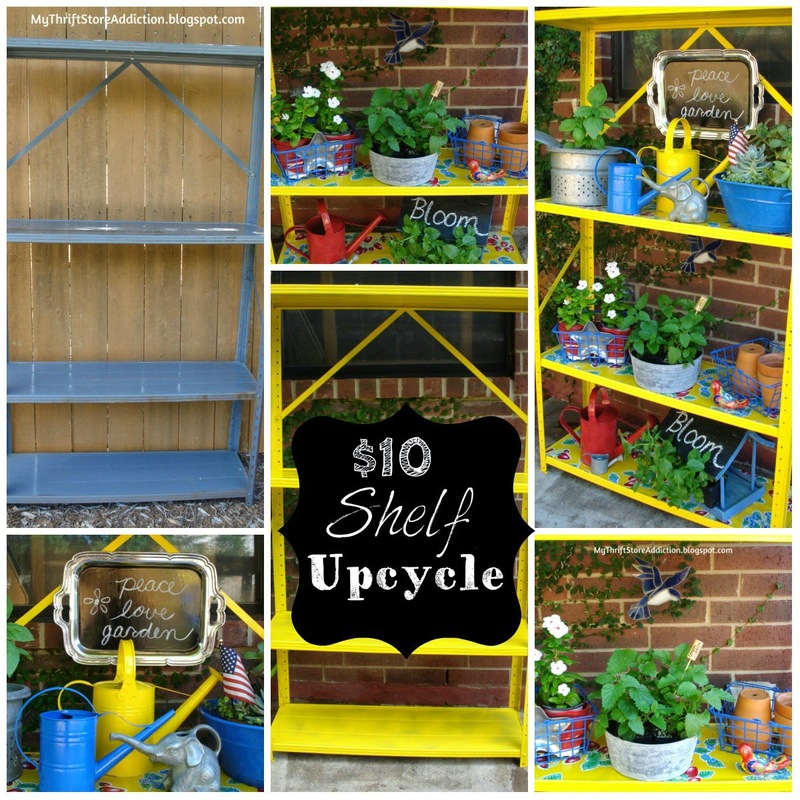 $10 Upcycle: Utility Shelf to Potting Stand! 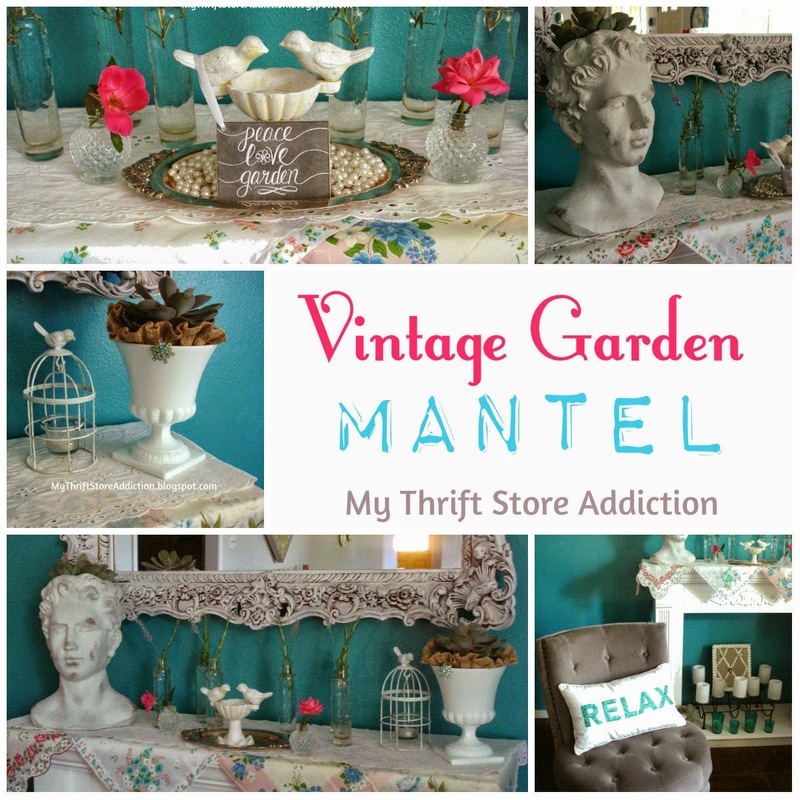 Vintage Garden Mantel: Peace~ Love~ Garden! Greetings Friends! Am I the only one who feels like Summer is rushing past me? I cannot believe we have less than two weeks left of July! Lately, I've been in the garden so much, time got away from me and I realized my mantel was in need of an update. 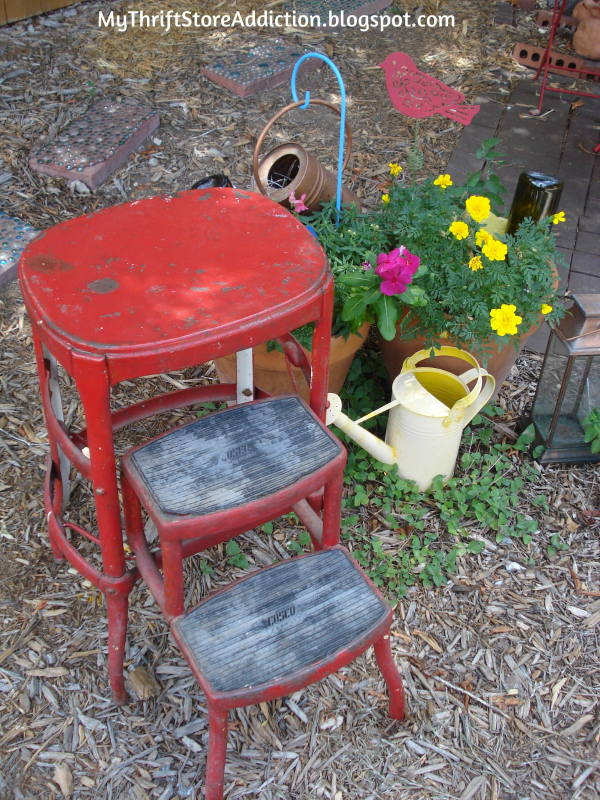 My passion for gardening, penchant for Vintage hankies and affection for whimsy provided ample inspiration. Plus, everything I used was thrifted or clearance. The results--my favorite mantel vignette to date! Happy Wednesday Friends! At first glance, this little thrift store table looked pretty forlorn. I walked past her the first time, but came back after a few minutes. I had a feeling she would look much more cheerful with a little love and paint. Sure enough, it was a simple transformation and only cost $4! 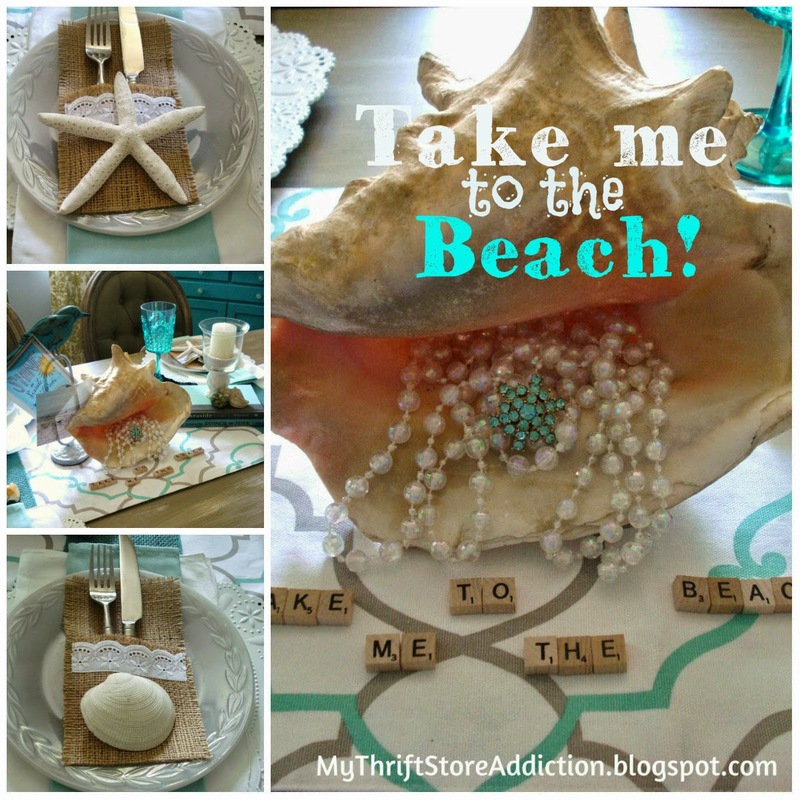 Take Me to the Beach Tablescape! Friday's Find: Juliet Gets an Apron! Thank God it's thrifty Friday, y'all--I am so glad you stopped by! 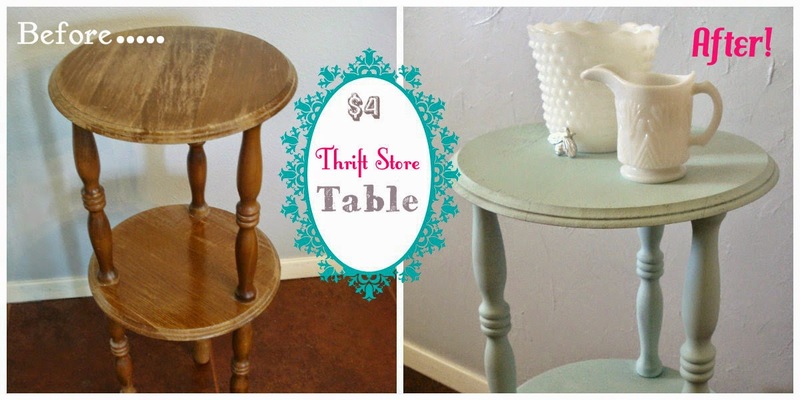 Today's feature combines one of my previous thrift store treaures with a recent yard sale find. Do you remember my charming dress form Juliet? She was 50% off at my favorite thrift store and ever since has cheerfully dressed up my living room corner. Depending on my whim, she has served as a lamp and even Christmas decor. When I found this pretty floral Vintage apron at a yard sale and got it home, I knew it would look fabulous on my girl Juliet--who doesn't love to play dress up?! 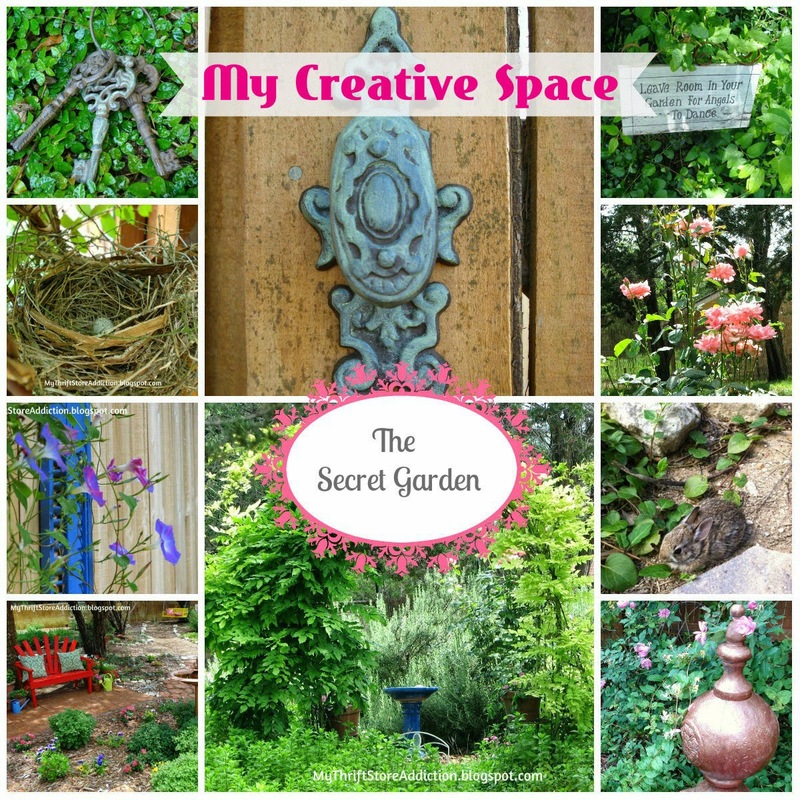 Welcome to Secret Garden: My Creative Space! Greetings Friends! Recently I was asked about my work space and creative process and it dawned on me that I have never given my readers a garden tour. Considering all of the places in my home that I truly love, my garden is first and foremost my creative playground and the place I am always inspired. It is where I began and continually cultivate my Etsy business--you can read more here --repurpose thrifted finds, complete an ever growing list of DIY projects, photograph all of the above and constantly ponder my latest blog post. It is where I may physically work to the point of exhaustion and yet am able to relax the most....welcome to my Secret Garden! Happy Fourth of July and Thank God it's thrifty Friday, y'all! Hope you are busy making memories with those you love. Through the years, I have been blessed with several thrifting buddies including my now grown kids who inherited my thrifting gene and my Mom who patiently humors me. Even though one of my closest friends moved several hours away, anytime we can get together thrift stores and estate sales are always on the agenda! Last weekend, I took my sweet friend Carly when she had a rare Saturday off from her retail job. We have recently bonded during our Bible study and she shares my desire to have pretty little things without spending a lot of money! We hit the yard sales first and struck Vintage treasure after just a few sales. Here's Carly's favorite find--isn't it lovely? She also picked up some summer reading books for her son for .50! 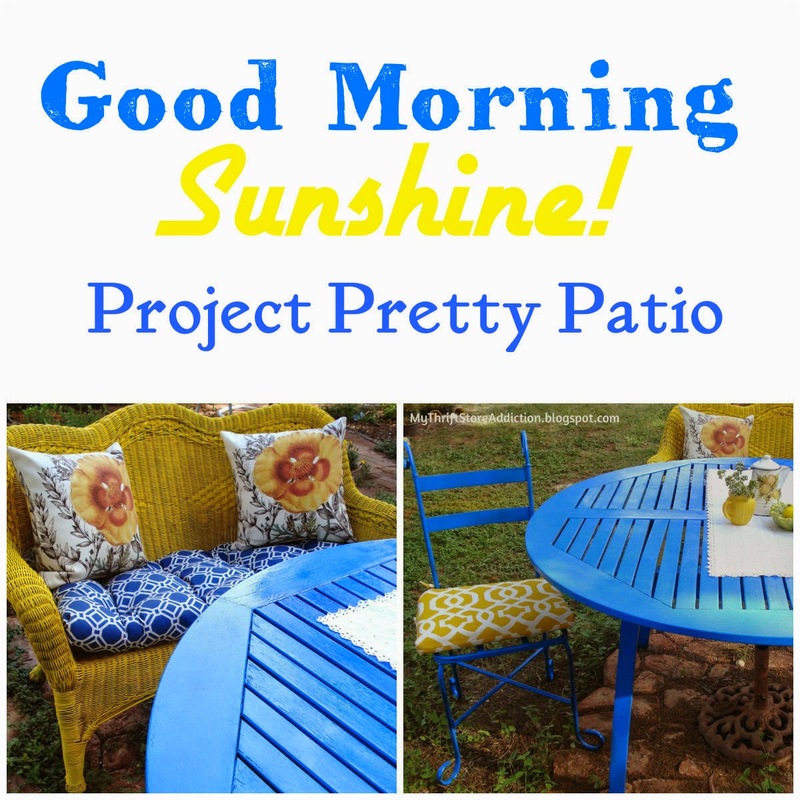 Good Morning Sunshine: Project Pretty Patio!